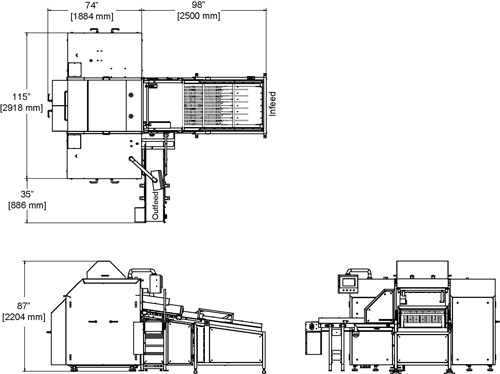 The Danfotech Type 14 presses bellies by means of a die set, in shapes that correspond to the desired finished product. The frozen meat is molded in the in the servo operated press, where it is exposed to three-dimensional pressure to attain uniform shape and quality for maximiz ed slicing yields. The pressing method ensures that no membranes are damaged, resulting in extra slices. The pressed length is attained with pressure applied from both ends simultaneously. 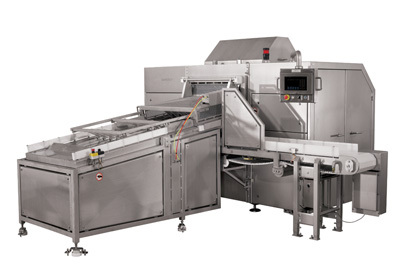 The Type 14 bacon press includes automatic infeed and discharge with additional ancillary systems available. Maximize slicing yields at optimal temperatures ranging from 14°-25° F (-10° to -4° C) depending on salt content. Presses 14 bellies per minute with powerful but gentle hydraulic pressing system. Press cycle establishes product height and width. Pressed length depends on size of belly. Computer controlled die set allows adjusting product thickness ±0.22” (5.5 mm) during operation without changing the die set. Internet connectivity option for remote troubleshooting. Allen-Bradley controls with color touch screen HMI. with AMI sanitary equipment design principles.